An experimental music-film about tuberculosis, an old sanatorium for the 1%, quackery, kindness and hope, by Philip Blackburn. Focusing on the extraordinary case of one TB sanatorium in Colorado, Cragmor, established in 1905 to house wealthy East Coast elites, the film imagines the experience of generations of well-to-do young sufferers when suddenly faced with mortality. Stars of Broadway, founders of the Fed, students from Skull and Bones, future captains of industry, and budding philanthropists (many of them talented artists now with plenty of time on their hands to produce work from bed) all came to chase the cure at Cragmor (now the campus of the University of Colorado, Colorado Springs). They came for the only treatments available at the time: rest, more rest, good nutrition, assorted quack placebos, and plenty of (vitamin D-producing) sunshine. Whether they lived or died, many of the patients stayed in the area for the climate and endowed many institutions in the area (60% of the local economy was TB related in the early 1900s). Thus, indirectly, a bacterium led to the establishment of a large city: Colorado Springs. Experimental composer Philip Blackburn discovered at least five of his family members had had connections to the Sanatorium, and created a mashup of archival materials all related closely to the site. The film grew out of a live performance event staged on site at UCCS featuring dozens of students, faculty, and community members coordinated by Jane Rigler through the Visual and Performing Arts department. 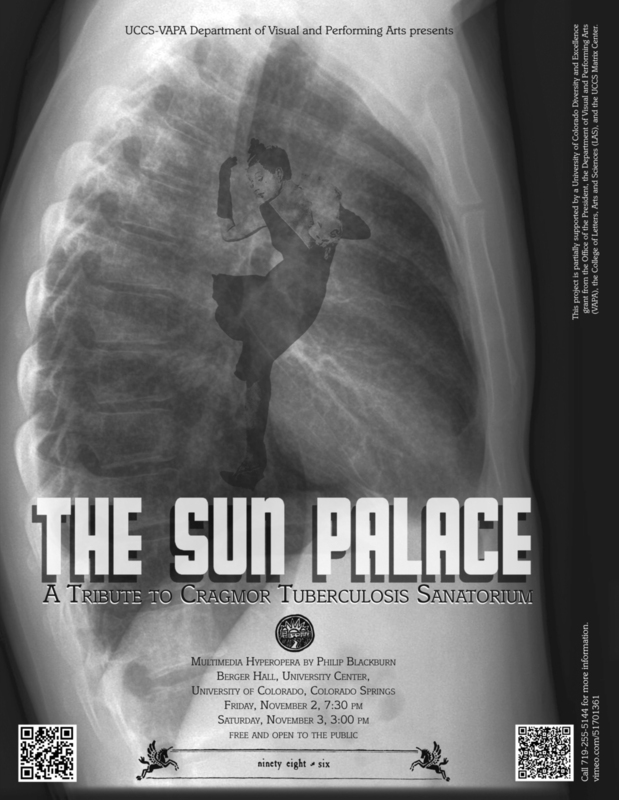 While inspired by many actual stories, anecdotes, details, and events, The Sun Palace is not a documentary or a single narrative so much as a dreamlike, hallucinatory, sensory environment in which we can imagine ourselves lost in medical history. Just as the original patients may have felt. Part experimental documentary, part music video on steroids, and part multi-sensory, multi-narrative pile-up. Every element is derived from actual events and details. It is mysterious, occasionally disturbing while offering an appreciation for the kindness of nurses, the barbaric ingenuity of doctors, and the fervent desire for life of the lungers and wheezers. After an introduction to the place and the medical procedures of the day, the viewer peers at a Cragmor Scrapbook that documents many of the creative outputs of the residents: photographs, paintings, poems, songs, and dances. Then, based on one patient's complaints in 1923 about the noise coming from 9 radios and 5 Victrolas (aka Stentorian Lane), we hear a quodlibet of music known to have been played there, while taking a walk on the neighboring mesa and around the Garden of the Gods, for the daily heliotherapy (healing sun rays). The patients had little to do all day but stare at the vista of Pikes Peak. Time goes slowly or quickly depending on one's mental state, day in and day out. Filming took place during the Waldo Canyon fire of 2012 so the patients who walked the hills for their blue sky therapy were, ironically, met with a choking black apocalypse. The film concludes with A Germ Requiem, a multi-layered, sweeping look at the wider world of TB throughout history, bringing to life the medical, sociological, and emotional aspects of the epidemic. Many of these are consistent with other public health scares of recent years, such as AIDS. The film is timely since multi-drug resistant (ie, incurable) TB is making a comeback; it is now the number one killer of people with HIV in Africa. 1.4 million still die of TB around the globe each year. Plagues come and go, but our responses to them speak volumes about the human condition.